I don’t know about you, but I don’t make biscotti often. Something about that double baking requirement, often leaves me a bit too impatient. If I crave chocolate, I want it now, not two bakes later. 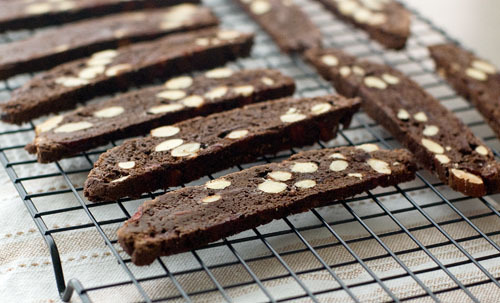 There are several exceptions to the rule, and Claudia Fleming’s recipe for chocolate biscotti is one of them. The pictures probably don’t do the recipe much justice. So perhaps I could offer a few words of advice instead. 1. I’ve actually made this recipe repeatedly, but I don’t think many (or any) of my friends are aware of it. It’s so good, it’s like a reclusive celebrity that rarely leaves the house. 2. It’s like a crispy brownie. 3. It’s the only version of hard tack that I’d ever want to take into a battle field. A baking battle field, that is. 4. If you can’t be bothered to bake it the second time, it actually tastes pretty darn awesome already, after the first bake. And with that, cue recipe. Place the cranberries in a bowl. Pour enough boiling water over to cover. Allow to cool then drain. Using an electric mixer fitted with the paddle attachment and set on low speed, mix together the flour, sugars, cocoa, salt and baking soda. Add the eggs one at a time, mixing well after each addition. Add the butter and extracts, mixing to combine. Stir in the almonds, chocolate and cranberries. Allow the dough to rest for 5 minutes. With wet hands, divide the dough into 2 logs, each 2 inches in diameter. Place them on lined baking trays and bake until firm. 30-35 minutes. Cool completely on rack. At this point, I prefer to chill the logs in the fridge for a few hours to make it easier to slice. Using a serrated knife, slice each log on the diagonal into 1/4-inch-thick slices. Arrange on lined baking sheets and dry in a 95’C oven for 1 to 1/2 hours until firm and crisp. Transfer to a wire rack to cool. Yi, once again I feel like a loser for not taking advantage of all my cookbooks. I have Claudia Fleming’s book but haven’t even looked at it for years, too bad. The good part about biscotti is that they last for ever once you bake them. I have never made chocolate biscotti, not sure why, time to change that! I love biscotti but haven’t tried a chocolate one yet. These look and sound delightful, Y! Beautiful! a great flavor combo. love anything cranberry! have never tried a choc-cranberry combination. These look stunning! The double-baking has always put me off, as well as the fact that each recipe I’ve come across saying it will make a mammoth load of biscotti! Biscotti isn’t the prettiest thing in the world, but gosh, I love it when it is super hard and you can dunk it into a hot drink! I really like the idea of snacking – I mean taste testing – on some after the first bake. It’s so hard to wait for the second baking…. Martha Stewart has a chocolate pistachio biscotti recipe that seems similar, if my memory isn’t letting me down… I absolutely love it *because* it’s not too hard, and usually biscotti’s jaggedness hurts. 🙂 I’m with you on the hard tack, though. The idea of it freaks me right out. Gosh I love biscotti. fairly straightforward and the double baking doesn’t even bother me. But the combinations possible? Love that. Add cranberries to biscotti is a nice nice touch. 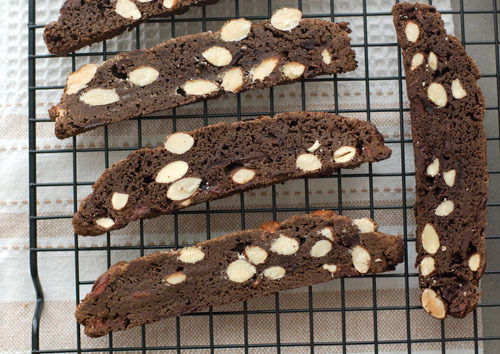 I’m picturing these biscotti dipped in hot cocoa…mmm, perfect! I’ve never baked biscotti; my mother really enjoys baking them so I leave it up to her when we end up in the same country. Those little things sure are addictive! Ooh I love how thin they are! Chocolate is my favorite flavor of biscotti, despite not being much of a chocolate fan in general. I’m usually in charge of making the biscotti at work and it’s easily my favorite thing to do. I agree it tastes mighty good just after the first bake, too! Oh my, you have me craving chocolate at 7am! How lovely. I have never baked a biscotti for the same reason you mentioned. The whole, “cook twice” thing has always played with my impatience. These look delicious though so I may have to be a little less impatient and give it a go. reminded me of the biscuits I had once, cranberry and almond… Lovely. I am so not a breakfast fan- but perhaps biscotti could make it more bearable! Have to try these soon. They look divine Y. I’ve heard so much about this book. Not very easy to find a copy these days.